One professor. Three hundred undergrads. Two hours of material each session. Roughly 30 or more classes in a semester. Sound daunting? At many universities, that’s the reality of “lecture life,” especially for core classes. And when finals roll around and you’re expected to remember and understand the lecture material, you’ll be glad to have a secret superpower at your side: transcripts of lecture notes. 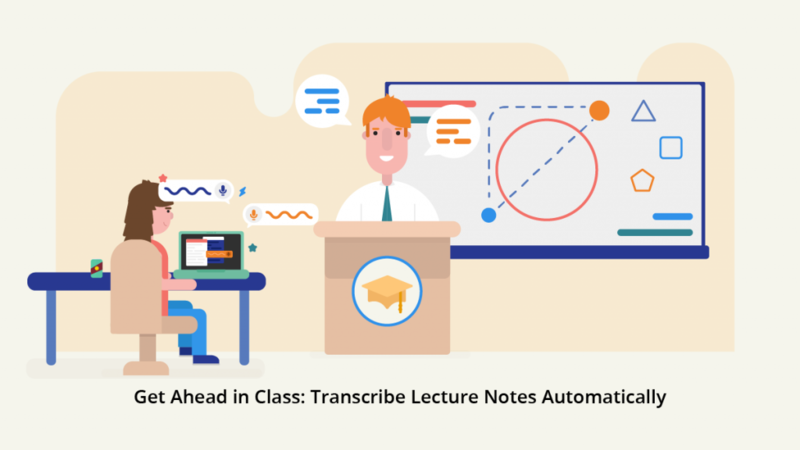 Here are eight ways that automatic transcription for lecture notes will help boost your grades and make studying more effective. 1. Get the details right. Which scientist did the professor say made that breakthrough discovery? What book did she refer to for further information? Whether the professor was talking too fast or the classroom was noisy, it’s all too easy to miss important pieces of data during a lecture. Having a transcript to review later ensures that you have all your facts straight. It’s also a handy way to confirm you have the parameters of an assignment correct. Did he say the essay had to be three pages or five pages? The details matter. Big time—so rely on a transcript to create a checklist of next steps for upcoming projects. 2. Search for key terms. Professors often cover topics at a breakneck speed and are bound to jump around from issue to issue. That can make it hard to consolidate and organize notes to use for studying for a final or to write a paper on a topic that was discussed. When you have a transcript, you can easily jump from section to section to search for the terms you need. In addition to finding key terms, having a written copy of the lecture means you can actually re-organize your notes in a way that makes more sense to you and then create study guides. Maybe each lecture ends with a review; you can take all the summaries from the term and copy and paste them into your own personalized study aid from the transcript. 4. Improve your focus in class. We don’t advocate foregoing your own notes in favor of a transcript: After all, many students find that taking notes helps improve retention because it involves another “sense,” rather than just listening. Furthermore, a study published in the journal Psychological Science found that students who took notes by hand performed better than those who used a keyboard. But the main problem with taking notes by hand is that it’s hard to catch everything.The unintended consequence of concentrating so hard on taking notes is that, in your quest to get all the information, you might inadvertently miss out on something important. It also precludes you from fully participating in one of the most important aspects of a lecture—formulating questions as you go along. Take notes on the material as needed, but rest easy knowing that if you miss something, you’ll be able to add it in later with the help of your transcript. Quizzing yourself is much easier when you can use a transcript to copy and paste data to make flash cards. If you don’t feel like messing with paper, download an app that allows you to create your own quiz, and scroll through the digital cards during your cram session before finals. 6. Clarify with the professor. As you’re listening to the lecture, you can quickly mark down the time when the professor covered something you didn’t understand. Then, when you review the transcript, you can find the correct time and use those notes as a tool to create a short list of questions to bring to the professor at her next office hours, or raise with your study group. 7. Be the class fave. Did your friend have to miss a lecture? Sure, you could give him your notes, but often your own shorthand creates so many questions for others that it’s not all that helpful. A transcript allows your buddy to feel like they he was really there. You also can volunteer to create the study guides for your upcoming review session—and let someone else make the visual aids. While they pour over the Prezi, you can spend just moments getting your notes from the automated transcript into a shareable format. 8. Save time for what really matters. Sure you could tape the lecture and transcribe it yourself, but listening and copying down notes is tedious, not to mention extremely time-consuming if you’re not a world-class typist. Using a service cuts out all the busy work, freeing up your time to focus on more important scholastic matters. Using an automated transcription tool like Temi, you can simply record the lecture on your smartphone, upload it to your Temi dashboard, and get a full transcript within a few minutes — for less than the cost of your daily latte. While the transcript may not be 100% correct, Temi offers an editing tool that allows you to check the text against the audio to correct any errors easily. Want to know more? Try Temi today and see how it can reinvent the lecture.